Most of us have access to at least two libraries within a reasonable distance of our homes. The nice thing about going to different libraries is they typically each carry a different variety of graphic novel titles. While one of my libraries was very heavy on the Superman titles, the other one had quite a bit of Batman trades to read. Since I have been enjoying the Batman and Robin series so much since I returned to reading comics in 2009, I was delighted to see that this particular library carried Batman and Son. Since I knew very little about Damien Wayne’s origin this was a must have for me and I read the whole thing in nearly one sitting. The relationship between Batman and his Robins have always been fascinating. What make this particularly interesting is that this future Robin is actually Bruce’s flesh and blood. It is also something he never planned and probably never thought would happen. Batman and Son was written by Grant Morrison, Illustrated by Andy Kubert, Jesse Delperdang, and John Van Fleet. 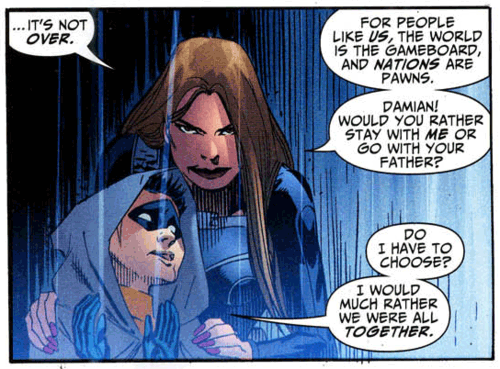 As most of you know Damien Wayne is the product of Bruce Wayne and Talia al Ghul. Talia, daughter of Supervillian Ra’s al Ghul, raises her son in a non-traditional manner opting to teach him the skills of an assassin at a very early age. In fact Damien is barely 10 years old, I believe when he meets his dad for the first time. Needless to say, this is a huge shock to Batman and he must quickly take the volatile young Damien under his wing and try to raise him as his own. We find out pretty quickly that being raised by the League of Assassins takes its toll on a young impressionable mind and Damien has basically had no semblance of a real childhood. Consequently he is cold, sadistic, and defiant to boot. Morrison has a wonderful way of writing this complicated father and son relationship in a way that makes the reader truly care about their future well being. You sort of feel sorry for Damien and really yearn for warm moments between him and Bruce only to be disappointed time and time again. Damien’s inability to relate to this new world he’s been thrown into is the central focus of this book. Alfred plays a particularly important role in the title as sort of a mentor to Bruce who is trying to find his way through this very difficult parenting assignment. For those of you who have been reading the Batman and Robin series, but haven’t read this yet you owe it to yourself to get a hold of it. It’s a great character study of the absentee father and the neglected son and how they try to coexist with each other. Batman has faced many dangerous foes and defeated them with great ease. This time I believe he has met his match as he grapples with how to accomplish one of the greatest tasks of all; raising a well adjusted child. never even heard of this title, but the review sold me. thank you for such a wonderful review. i have just ordered this title and cant wait for it to be delivered. Sorry I missed your entry. Thank you and hope you enjoy it!